A Solifugid (plural form Solifugae) is an arachnid belonging to the order Solifugae. The name Solifugae comes from Latin and means "flee from the sun", a reference to their nocturnal nature. The order is also known by the names Solpugida, Solifugae, Solpugides, Solpugae, Galeodea, and Mycetophorae. The order includes 900 known species of wind scorpions, sun spiders and camel spiders. * Solifugids have less than a one year life cycle. They have proven difficult to keep long-term in captivity. Most people know this upfront about these creatures. ONLY 24 hour live guarantee upon shipment receipt is allowed. • Ammotrechella stimpsoni "Florida Solifugid", WC unsexed juveniles to adults, Rarely made available: May-Oct., $35, 6+@$33 ea. • Eremobates sp. 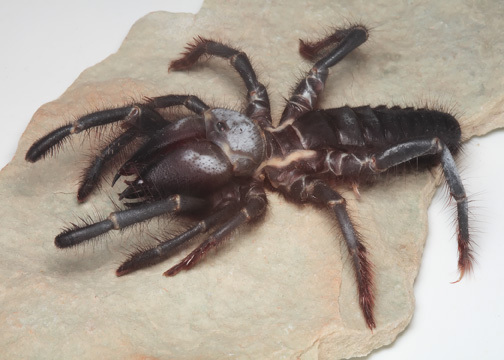 "Arizona Solifugid", Seasonally available May-September, $25, 6+@$23 ea. • Eremobates sp. "Texas Solifugid", Seasonally available May-September, $25, 6+@$23 ea.